That is all from us for today. You can continue to follow our live football coverage, in the shape of Arsenal v Liverpool, here. Or if you fancy some Championship, you can follow Middlesbrough v Stoke here. After that there's Wolves v Tottenham. More from Leicester defender Wes Morgan, speaking to Sky Sports: “What he [late owner Vichai Srivaddhanaprabha] has done for everyone, it is astonishing, he has such a big kind heart and it is rare to see in this day and age. That’s the type of person he was, his generosity and always smiling he was just a normal guy not a billionaire which goes to show his character. We will miss him. “I have to mention the support from Cardiff, and everyone, has been amazing. We went to see the tributes at the stadium and you see shirts from most teams which is amazing and I want to say thank you to everyone that has come to show their support. Leicester defender Wes Morgan, speaking to Sky Sports: “It’s been a tough week for us and we decided to play this game, we know what The chairman’s wishes are and he would want us to go out there and play and get the three points. We went out there and got the points that he would want. “It was emotionally charged all week building up to it, we knew it was going to be a big occasion we had to stay focused and not let our emotions get out of hand. It wasn’t easy but we needed to do it for the chairman. “We are his family, we spent many times and memories both good and bad together. He was one of us and not just the players and staff but the whole city of Leicester too. We wanted to give something back to him today and he will always be in our hearts." Cardiff boss Neil Warnock, speaking to Sky Sports: “Strange, what can you say. You won’t get another game like that, it felt surreal. I can’t fault the lads. "I thought we matched them, they just had better players in certain areas. It came down to fine lines, if Murphy had got a foul before their goal, those fine margins you need to go your way. Leicester manager Claude Puel speaking to Sky Sports: “It was a difficult game to play and to prepare it was important to keep concentration in set pieces and second balls, but I think from the first minute until the end we kept our concentration and our dedication. We had a lot of chances and we deserve this result and it is a fantastic opportunity to honour the chairman. It is a good balance between emotion and concentration which is difficult, now is just the first step and I hope we can continue next week with the same feeling. It will be difficult because we come back from Bangkok in the middle of the week for our first home game and we know before and after we have events to honour the chairman and it will be important to keep our self-control. "Everyone grieves in different ways and the opportunity was given and we wanted to go. We are a family and wanted to pay our last respects together." Everton boss Marco Silva, speaking to Match of the Day: "We were constant, played with quality. It was our best performance at home this season. First 30 minutes we played really well. The only thing I didn't like was that corner when they scored. We worked for and prepared for. You need to react faster. What I liked was the second half. We kept doing what we did in the first half. We had chances to score more and it was a good and deserved win. "It is important for our strikers to score. Richarlison did well. When a player scored twice people speak a lot about them but so did others in the team. Richarlison is a fantastic football player and he gives everything for us. He fights and enjoys the game. But it is not just him. For us to play well and score goals we need to do big work. "For us it is important to do better than last season. We want to give the fans something to enjoy and feel a connection with what we are doing." West Ham United boss Manuel Pellegrini: "We needed to win because we have had a lot of games where have created chances but not won. Yes, we could have scored more. "The first and most important thing is we won the game. We have been playing well and creating chances but we have either drawn or lost. We trust the way we play. I think the fans enjoyed this and in the moments of bad results I have always felt they were behind the team. "Felipe Anderson scored two goals, he was involved in two goals and missed two goals. I think this game will give him a lot of trust for the future." "Today was difficult, coming out for the warm up was tough, the first 10 minutes i couldn’t steady myself, i was shaking a little bit. But it was nice to get a win to take to Thailand now and hopefully we did his family proud. "It has been hard, we have tried for a few hours a day to be professional and train hard but everyone wanted to play and win for his family. His family have been strong, the courage they have had. I feel just an overwhelming sense of pride that Vichai built and the family of Leicester City." Watford manager Javi Gracia, speaking to BBC Sport: "I think the first half we played much better, we had more chances - clear chances - and a lot of them. "If you don't score then from a free-kick Newcastle can score. We need to improve for the next game. I can be disappointed with the result but not with my players. "We were dominating the possession, had more chances and you know if you don't score in that moment then something like today can happen. "I like to be demanding and want us to finish better, but we have played well and need to keep this level. Today was a missed opportunity but that is football. "After playing like we did today I have good feelings. Today it wasn't enough to get a good result but we did many things well. I'm sure in the future we will get more chances." Brighton boss Chris Hughton, speaking to Match of the Day: "We needed to start the second half better. We had the lift from the goal and were up against a team who have spent big money on quality players. We weren't in the game long enough in the second half. They got the goal and their tales were up. We then played two up front but were up against a quality team. "We need to keep the ball better. Sometimes you have to accept you are up against quality teams. Keeping clean sheets is tough, especially three on the spin. "You kick on buy accepting you are Brighton playing a second season in the Premier league. There will be ups and downs. We were playing a team who will push for the top six. "You always have to look as a whole. We have had three really good results and then a bad result. We have to accept that and be better next time. Come out fighting in the next game." Burnley boss Sean Dyche, speaking to Match of the Day: "We reacted well to falling behind. The mentality and energy were good in the first half. The third goal is a real blow and we are chasing the game when they score the last one. "I'm not disappointed with the mentality of the team but we can't give away the ball so cheaply. There are some details in that game that need working on. "You have to start with the basics. We have been punished to be fair. Sometimes it is just the details. The mentality was intact today but there are still lots of things we can do better. We are a team improving and growing. It’s a hard one to take. I am proud of these players at what they have achieved so far." Newcastle manager Rafael Benitez: "In my opinion we deserved to win before today but to do it today with the team working so hard and with fans behind us was good. "We had three injury problems and three substitutions but the reaction was good. It is a great three points. "All three players really contributed, we needed energy and commitment from everyone and the three players quickly focused and did what they had to do." On the goal: "It was a good delivery and good movement, these kind of balls are very difficult for defenders even if they are in the right position. I'm really pleased with the performance and the result. "We needed the first win to have more confidence and hopefully we can play with the same level and intensity and hopefully score a few more goals." Brighton defender Shane Duffy, speaking to Premier League Productions: "We knew coming here they were a good team and we had to keep it tight. They didn't have to work hard for their goals. They are good here. A couple of individual mistakes, which happens. It is a bad day at the office. "We didn't play second half, they dominated the game and fully deserved it. They are going places." Watford skipper Adrian Mariappa: "I thought we created a number of good chances, clear ones, and we haven't taken them. We have been punished for it. "It's a Premier League match and the team you're playing against will be a good side. For the goal it was a quick ball in but it was a set-piece and we're disappointed we didn't defend it. "We couldn't get the ball in the back of the net. It's disappointing but we created a lot of good chances and need to take those positives into the next game"
Burnley forward Chris Wood: "We fought hard and tried to get back to what we are good at, but we just didn't see it out at the end. The way we played last season, we need to get back to that. There's improvements every week but we need to do it properly and see games out." 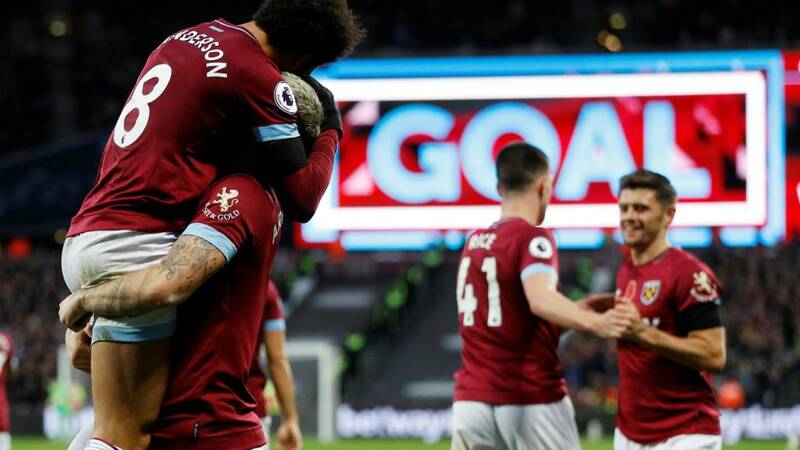 West Ham forward Marko Arnautovic, speaking to Match of the Day: "For 90 minutes we dominated completely. We could have scored more - we had the chances. Overall we had an amazing game and we stayed calm when they equalised at 1-1 and 2-2. It was not easy but we deserved the win. It is a good feeling to get three points."